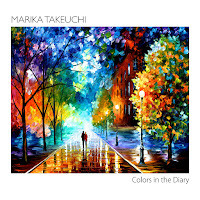 In November of 2014 I covered Marika Takeuchi’s album Rain Stories. Here it is April 2016 and the latest release from this most talented pianist and composer titled Colors in the Diary is now available. Her 4th album is produced by the Grammy-winning producer Will Ackerman and features the world-class cellist Eugene Friesen and violinist Si-Jing Huang. Even though the piano work is good enough to stand alone the addition of these two musicians most certainly accentuate every note produced by the ivory keys.